Create a macro object with submacros that contain the menu commands. Create another macro object that creates the menu itself. Note: Are you using Access 2007? If so, skip down to the section Create custom shortcut menus in Access 2007. 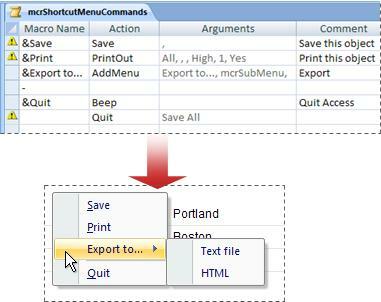 Tip: If you want to learn how to create custom shortcut menus in Access using Visual Basic for Applications (VBA) code, see the article Create a shortcut menu for a form, form control, or report. In this step, you create a macro object with submacros, each submacro of which will be a separate command on your shortcut menu. You can use a submacro within a macro object to define a set of macro actions. Submacros within a macro object can be called separately from various control and object events. The individual submacros within a macro object each have a unique name and can contain one or more macro actions. 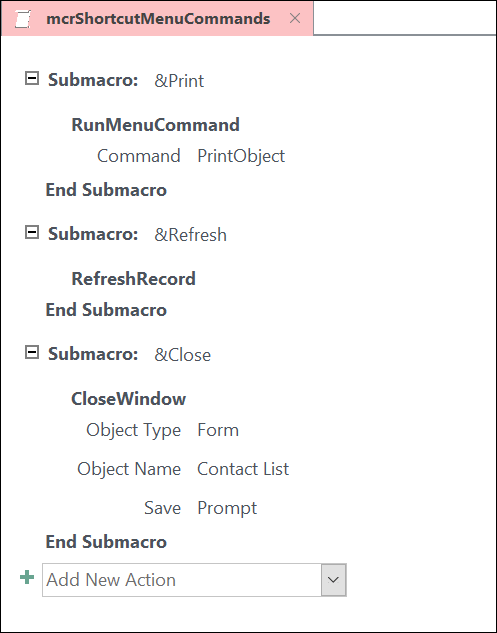 Add a Submacro Macro statement to the macro design window and name the submacro what you want to display on the shortcut menu (for example, "Print" or "Refresh"). Tip: To create an access key so that you can use the keyboard to choose the command, type an ampersand (&) before the letter that you want to be the access key in the command name (for example, "&Refresh"). This letter will be underlined on the menu. Within the submacro, select the first action you would like to take place when you click the command on the shortcut menu. If there are more actions that you want to take place when you select this command, add them as separate macro actions within the same submacro. Save and name the macro object for example, mcrShortcutMenuCommands. The following illustration shows an example macro object with three submacros for a custom menu or shortcut menu. This step might seem redundant, but to create the shortcut menu from the macro object that you created in Step 1, you must create a second macro object that contains the AddMenu macro action. This macro action is sometimes called the "menu macro". In the Add New Action combo box on the macro design window, select AddMenu. In the Menu Name argument box for the AddMenu macro action, type the name of the menu (for example, "Form Commands"). This argument is not required, but is recommended if, in Step 3, you plan to add the menu to a Ribbon tab (such as the Add-Ins tab of a form or report). If the menu is added as a shortcut menu in Step 3, the Menu Name argument is ignored. In the Menu Macro Name argument box, enter the name of the macro object that you created in Step 1. Save and name this second macro object, for example, mcrAddShortcutMenu. The following illustration shows an example menu macro object that creates the menu we designed in Step 1. Use this procedure if you want the menu to appear on the Add-Ins tab for a specific form or report. In the Navigation Pane, right-click the form or report where you want the menu to appear, and then click Design View. On the Design tab, in the Tools group, click Property Sheet. On the Other tab on the Property Sheet, in the Menu Bar property box, type the name of the macro object that you created in Step 2 (in this example, “mcrAddShortcutMenu”). Save your form or report changes. For more information about Ribbon customization techniques, such as adding custom tabs or hiding the default tabs, see the article Create a custom ribbon in Access. 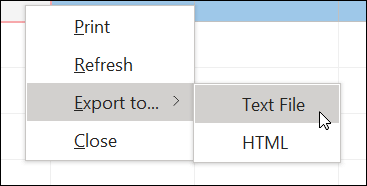 Use this procedure if you want the menu to appear when you right-click a specific form, report, or control. To select the entire object, select Form or Report from the list at the top of the Property Sheet task pane. On the Other tab on the Property Sheet, in the Shortcut Menu Bar property box, type the name of the macro object that you created in Step 2 (in this example, “mcrAddShortcutMenu”). Make sure the Shortcut Menu property is set to Yes. Click OK to save your changes in the Access Options dialog box. Close and then reopen your database for the changes to take effect. Custom shortcut menus replace the default shortcut menus for the objects they are attached to. If you want to retain certain Access commands to use on these menus, use the RunCommand macro action to put the commands into the macro objects for the menus you want them in. When you specify a menu macro for a form or report or for the database, Access runs this menu macro whenever the form, report, or database is opened. If you make changes to the menu macro object or the macro object that defines its commands while the form, report, or database is open, you must close the form, report, or database and reopen it to see the changes. Then, follow Step 1 again to define the commands for the higher-level menu object. Add the submenu as an item in the higher-level macro object by using the AddMenu macro action. The following illustration shows the macro object for a menu that contains a submenu. The third submacro in this example macro object creates the Export to... submenu (mcrShortcutSubMenuCommands). You can create multiple levels of submenus by using AddMenu macro actions in the macro objects for each level of menu. Make sure to supply a value for the Menu Name argument for each AddMenu action, otherwise the submenu will appear as a blank line in the higher-level menu. Macro expression conditions using If/Then/Else blocks are supported in the top-level menu macro object only. In other words, you can use a condition expression in a menu macro object to determine if a particular menu or shortcut menu will be displayed, but only for the menus on the top level. You can't use condition expressions to display or hide commands or submenus on the menus. You can also use a condition expression to hide or show a custom shortcut menu or global shortcut menu. Optionally, the menu macro that you create in Step 2 can be part of a macro object. For example, if you have several shortcut menus for different objects or controls, you can create a single macro object that contains all of the necessary menu macros. Make sure to have a unique name for each submacro. In Step 3, use the following notation to refer to the macro: MacroObjectName.SubmacroName. For example, mcrAddShortcutMenus.AddMenu2. The macro design window is different in Access 2007 compared to later versions so expand the following sections to follow along if you're using Access 2007. Note: The Macro Name column is hidden by default. To display the Macro Name column, on the Design tab, in the Show/Hide group, click Macro Names. 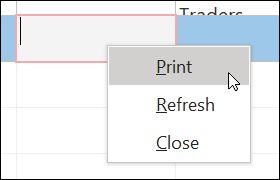 In the Macro Name column, enter the text that you want to display on the shortcut menu (for example, "Print report" or "Save"). Note: To create an access key so that you can use the keyboard to choose the command, type an ampersand (&) before the letter that you want to be the access key in the command name (for example, "&Save"). This letter will be underlined on the menu. Note: To create a line between two menu commands, type a hyphen (-) in the Macro Name column between the appropriate menu commands. 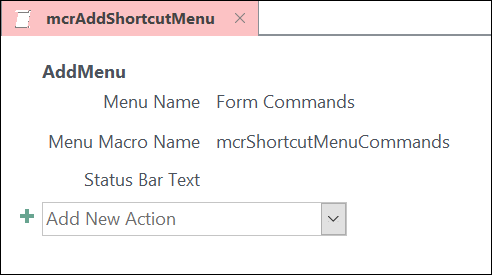 This step might seem redundant, but to create the shortcut menu from the macro group that you created in Step 1, you must create a second macro that contains the AddMenu macro action. This macro is sometimes called the "menu macro". Under Action Arguments, in the Menu Name box, type the name of the menu (for example, "Report Commands"). This argument is not required, but is recommended if, in Step 3, you plan to add the menu to a Ribbon tab (such as the Add-Ins tab of a form or report). If the menu is added as a shortcut menu in Step 3, the Menu Name argument is ignored. Note: To select the entire object, select Form or Report from the list at the top of the Property Sheet task pane. 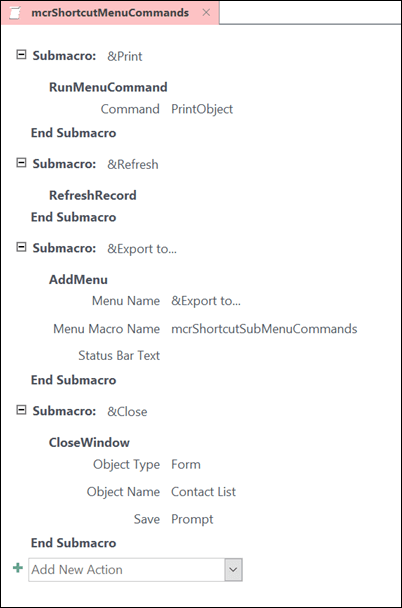 To create a submenu, follow Step 1 to create a separate macro group that contains only the submenu commands. Then, follow Step 1 again to define the commands for the higher-level menu. Add the submenu as an item in the higher-level macro group by using the AddMenu macro action. The following illustration shows the macro group for a menu that contains a submenu, and then shows the resulting shortcut menu. The third line in the macro group creates the Export To... submenu (mcrSubMenu). Macro conditions are supported in the top-level menu macro only. In other words, you can use a condition in a menu macro to determine if a particular menu or shortcut menu will be displayed, but only for the menus on the top level. You can't use conditions to display or hide commands or submenus on the menus. You can also use a condition to hide or show a custom shortcut menu or global shortcut menu. Optionally, the menu macro that you create in Step 2 can be part of a macro group. For example, if you have several shortcut menus for different objects or controls, you can create a single macro object that contains all of the necessary menu macros. Make sure to display the Macro Name column and type a unique name for each macro. In Step 3, use the following notation to refer to the macro: macrogroupname.macroname. For example, mcrAddShortcutMenus.AddMenu2.